Pinoculars can track people who show interest in your product or service as leads. 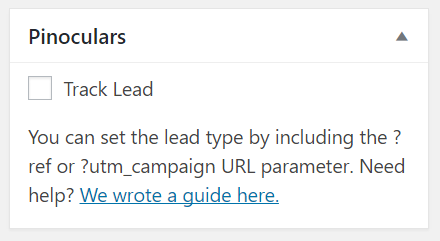 Once setup, the “lead” event with “lead_type” data will be sent to Pinterest. To start tracking, there are 2 things you need to do. Check the box next to “Track Lead” and update your page or post. This page will now start sending lead data to Pinoculars. How do you set lead data? Find out in the next section. Set the label for your leads by changing the way you link to your website. At the end of your website link, add ?ref=LABEL where LABEL is your classification for the visitor. Alternatively, add ?utm_campaign=LABEL to the end of your links. For example, if you’re posting links to Twitter, make your link www.example.com?ref=tweet. If your link is in an email campaign, make your link www.example.com?ref=newsletter. Whenever someone visits your website, Pinoculars will save the ?ref or ?utm_campaign value. Once this visitor visits a page with “Track Lead” checked, Pinoculars will send lead data to Pinterest. If ?ref or ?utm_campaign isn’t set, Pinoculars will attempt to record the URL of the website that the visitor last visited. If the visitor came to your site from Facebook, Pinoculars will record the lead type as www.facebook.com.